Noktas powerful and technology filled machines are quickly edging out the competition. The Impact is a force to be reckoned with when it comes to treasure hunting. Check it out at The Diggers Den. 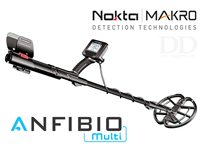 Nokta Metal Detectors, whose main expertise area is metal detectors, offers a broad range of personal and commercial products used for a variety of purposes, including Hand Held Detectors, Body Scanners, Gold Detectors, Coin Detectors, Treasure Detectors, Deep Penetrating Detectors, Mining Detectors, Military Detectors, Ballistic Detectors, Technical Detectors, Industrial and Security Detectors. Copyright © 2013 Diggers Den Detectors. All Rights Reserved.